Every Microsoft product has a lifecycle, which begins when a product is released and ends when it’s no longer supported. Knowing key dates in this lifecycle helps you make informed decisions about when to upgrade or make other changes to your software. 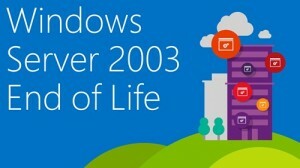 During July 2010, Microsoft changed from providing full support for Windows Server 2003 to releasing critical patches only, and from July 14 2015 Microsoft ends support for Windows Server 2003. From the 14th July 2015 you will no longer be covered for patches, fixes or receive any Microsoft support. To put this in perspective, 37 critical updates were released in 2013 for Windows Server 2003 under Extended Support, and new security vulnerabilities are continually found for the aging Operating System. As of the 15th April 2015, your system will not suddenly stop functioning, but you may start to come across issues, such as compliance. As Windows Server 2003 will be end of life, customers in regulated industries or handling regulated data, may find that they are no longer compliant and could result in potential difficulties continuing to do business. The total install base of Windows Server 2003 remains massive, in July 2013 Microsoft reported that globally there were approximately 24 million live instances, so the push to get businesses upgraded is well underway. During the past few years IMEX has gained a wealth of experience in migrating users away from Windows Server 2003 to the most recent Windows Server 2012R2 operating system. So please get in touch if you would like to discuss the options for bringing systems up to date, whether it’s maintaining on premise servers or even moving towards Cloud based infrastructure services. To help Windows Server 2003 users plan for the migration, Microsoft are encouraging users to review its sponsored white paper by IDC, a premier global provider of market intelligence and advisory services.